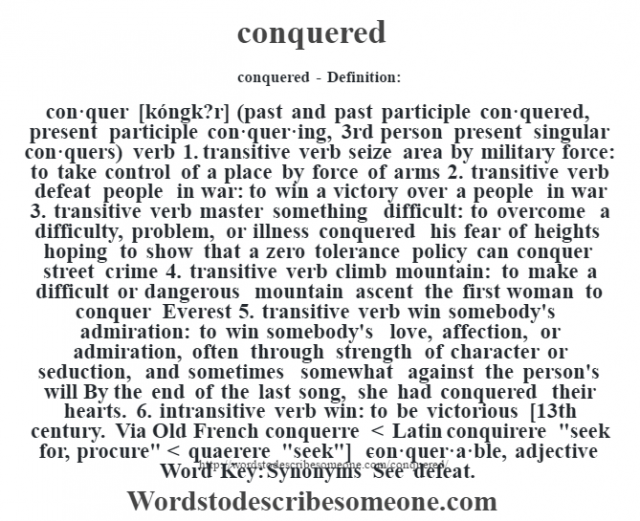 con·quer [kóngk?r] (past and past participle con·quered, present participle con·quer·ing, 3rd person present singular con·quers) verb 1. transitive verb seize area by military force: to take control of a place by force of arms 2. transitive verb defeat people in war: to win a victory over a people in war 3. transitive verb master something difficult: to overcome a difficulty, problem, or illness conquered his fear of heights hoping to show that a zero tolerance policy can conquer street crime 4. transitive verb climb mountain: to make a difficult or dangerous mountain ascent the first woman to conquer Everest 5. transitive verb win somebody’s admiration: to win somebody’s love, affection, or admiration, often through strength of character or seduction, and sometimes somewhat against the person’s will By the end of the last song, she had conquered their hearts. 6. intransitive verb win: to be victorious [13th century. 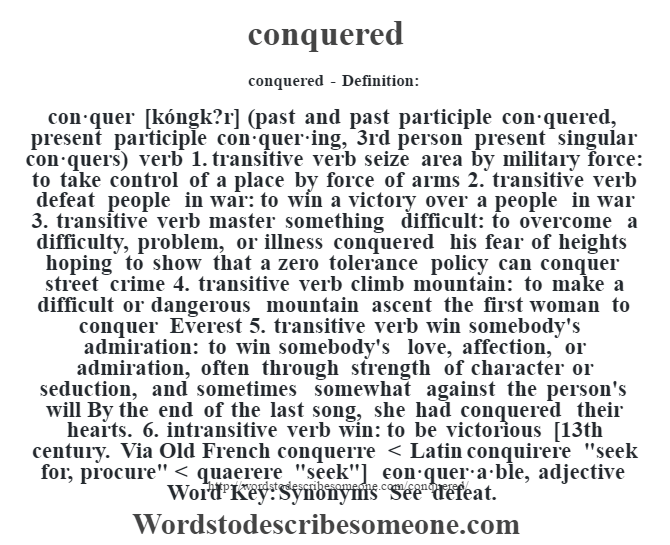 Via Old French conquerre < Latin conquirere "seek for, procure" < quaerere "seek"] -con·quer·a·ble, adjective Word Key: Synonyms See defeat.